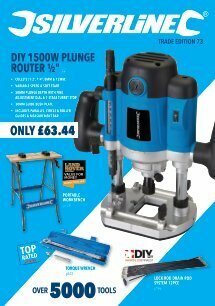 THE SILVERSTORM ROUTER IS AN AFFORDABLE POWERTOOL THAT MAKES ALL THE DIFFERENCE TO DIY PROJECTS. IT IS SOLIDLY BUILT AND PERFORMS WELL ; IT IS EASY TO USE AND HANDLES LIKE A MORE EXPENSIVE ROUTER. A powerful router for a great price invaluable sturdy carry box....great all round. Bought this to do worktop joints.....Did the job well. nice tool, good price, what else ? What is the voltage of the router? Hi Paulo. Thanks for your comment. The voltage of this product is 220V / 240V. Sans aucun problème, le matériel est parfaitement conforme à mes attentes. The plunge router works fine so far. Great that it has several adapters for different diameter of drills. One drawback is that it changes the frequency sometimes without rolling the speed roller. I have been using a low power (500W) German router for several years. Results not always good, specially with tough wood (oak). An experienced hobbyist advised me to switch to a more powerful model. So I bought this one. First run was oak wood 22 mm wide cut 8 mm deep. Beautiful result, machine had no problem at all, very precise and smooth cut. Boy, am I happy with this one! This Router ist very powerfull, when using it for preparing Kitchenette worktop. After some tries of handling, I am satisfied by my purchase. The router is a little bit heavy but it assure the stability during the use. All the accessories delivered with are welcome. Très bon produit au rapport qualité prix imbattable. It works, i used it under a table. I bought this router for my table and it works very good! Only bearings are a little noisy and i hope they work a lot of time but thanks to the 3 years warranty it is a minor problem. Cracking piece of kit.does jobs effortlesy and smooth to handle.have recommended to friends.who also diy. Ottimo prodotto con alta potenza del motore senza però avere forti vibrazioni, anche la rumorosità è accettabile. Le frese in dotazione sono di buona fattura. Utensile valido sia per hobby che per professione. Bought this to do a few jobs around the house. I looked around at a few other makes but decided to buy the Silverline.as i have bought a few hand and power tools from Silverline and they have always been well made and this is no exception a great router and a bargan at the price, it is as good as some other makes at twice the price. Substantial, powerfull and above all accurate and easily controlable thanks to the soft start feature. Whether used as a hand held tool or fixed to a router table this is an excellent router. With the 3 year warranty this router represents outstanding value for money. I''m happy with this tool , good price-quality relation. Can the power switch be locked on? What size collets does this come with? What size guide bush is included? This Silverline 2050W Plunge Router 1/2" is guaranteed for a period of 30 days from date of purchase against a fault developing in either the materials or the workmanship during manufacture. You can register for your 3 Year guarantee by registering your product online. Any faulty goods will be repaired or replaced free of charge.